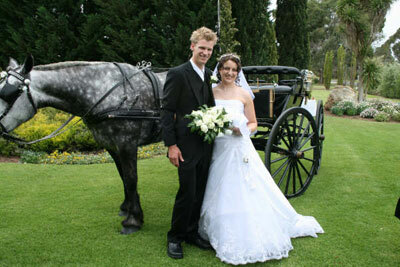 Carolynne’s Cottages lend their beautiful gardens to scores of couples each year for wedding ceremonies and photographs. A number of brides share a two bedroom cottage with their bridesmaids on the night before the wedding and often stay on to prepare for their special day. Possum’s Paradise is a favourite for couples to spend their first night together. You really will be in paradise when you choose Carolynne’s Cottages for your wedding night! The magnificent gardens which surround the cottages and the Bennier family home are available for all sorts of ceremonies including weddings, christenings, garden parties, memorial services and cup day luncheons. The venue is free of charge but setting up and removal of all structures is the responsibility of the client. More pictures of weddings held in our garden on our Gallery page.